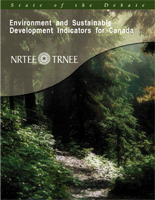 May 12, 2003 – Canada’s decision-makers have no way of measuring whether our country can maintain its current level of economic activity and prosperity into the future, said a new report entitled Environment and Sustainable Development Indicators for Canada released today by the National Round Table on the Environment and the Economy. To fill this gap in Canada’s understanding of its long-term economic prospects, the Round Table today unveiled six proposed new measurements – or indicators. These indicators will augment familiar economic data – such as gross domestic product (GDP) and the consumer price index (CPI). The Round Table worked in close collaboration with Statistics Canada to ensure the proposed indicators are realistic and usable. “Right now, Canada does not keep track of its ecological resources. We do not know if we are running down our stocks of ‘natural capital’ to the detriment of future generations’ prosperity,” said Dr. Stuart Smith, former Chair of the Round Table and Co-chair of the Indicators Steering Committee. Human capital is another key aspect of the Round Table’s indicators work, he noted. The report also recommends that Statistics Canada revise the System of National Accounts (SNA) to track all forms of capital that will contribute to future growth, and to link this information to existing economic data. While the indicators are clear, uncomplicated and designed for public awareness, the SNA is intended for specialists. Both would measure trends in the supply of the key ecological resources, as well as the human resources, that are the basis for future economic activity. Freshwater quality shows whether water quality is meeting objectives for particular uses such as swimming, irrigation and aquatic life. The indicator will show trends in how many monitored waterways are classified as “marginal” or “poor”. For the first time, national water quality information has been assembled, showing that in 2002, 22% of monitored waterways were damaged. Air quality is estimated using ground-level ozone (“smog”) measurements. For the first time, the report weights by population, air quality information from across Canada. The level of ground-level ozone that Canadians are exposed to is creeping up (+3% over 20 years), while scientists are finding that the pollutant sickens and kills people at lower levels than previously thought. Greenhouse gas (GHG) emissions. Developed by Environment Canada, this indicator tracks total annual emissions of the gases that are destabilizing the planet’s climate patterns. Canadian GHG emissions have increased 16% over the last 20 years according to the report. Extent of wetlands tracks changes in the total area of wetlands, often referred to as the lungs of the planet. The area covered by wetlands is a proxy for biodiversity. Surprisingly, there is no information at this time to calculate this indicator, but the report states that it could be constructed in two years from satellite remote-sensing data. Educational attainment tracks the percentage of the workforce-age population with post-secondary education. This indicator will reveal our investment in a well-educated workforce and will help us understand our ability to compete in a global, knowledge-based economy. The report found that this indicator went from nearly 43% in 1990 to 55% in 2000. This is the only human capital indicator in the group. This work on indicators was initiated in the 2000 federal budget. This small set of national natural and human capital indicators should be reported annually in the Finance Minister’s budget statement as a complement to traditional economic measures, the report recommends. The Round Table considers that natural and human capital are at least as important as financial capital and should be reported on at Budget time. “Canadians need to know if we are living well today at the expense of our children and grandchildren,” said Dr. Smith. “Just knowing the level of economic activity – the GDP – is not enough. It does not tell us about our natural capital stocks,” said David J. McGuinty, President & CEO of the Round Table. “Nature provides us with life-sustaining clean air and water, as well as exploitable natural resources and biodiversity’s encyclopedia of recipes, patterns and ideas. Natural capital is the foundation of our economy. If nature is in trouble, we better know about it sooner rather than later,” he said. In its recommendation that Canada’s System of National Accounts be expanded to gather more detailed information on natural, human and, over time, social capital, the report stresses the level of international interest. Canada can play a leading role in this development at this time. Eventually, it may be possible to calculate a single statistic to measure Canada’s total real wealth. The report also makes an urgent call on the Government of Canada to support the proposed Canadian Information System on the Environment (CISE), whereby the federal government would work with other levels of government to improve the quantity and quality of information about Canada’s environment. Existing information bases are incomplete and are often incompatible. “The new indicators and accounts will need the kind of national system that CISE will promote,” Dr. Smith stressed. The National Round Table on the Environment and the Economy was established in 1994. Its membership reflects a diversity of Canadian interests, including industry and environment groups. Appointed by the Prime Minister, the Round Table provides decision makers with information supporting a sustainable environment and economy.